We were going through the coupon circulars in this weekend’s newspaper and found this advertisement. There was much laughing. 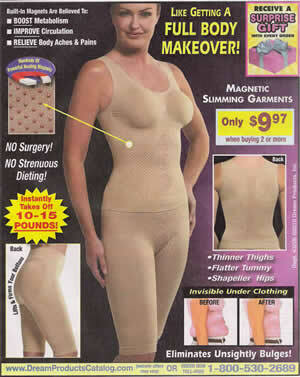 As I read the fantastic claims of instant weight loss along with the amazing healing powers of this $13 bodysuit, I began thinking of all the people who were reading that same ad and eagerly picking up the phone and forking over their hard earned money to place their order. After all, losing 10 to 15, even 20 pounds is as simple as a phone call, right? A 2007 study completed by the Will County Health Department identified 35% of county residents as overweight and 21% obese. Diabetes is on the rise. Preventable cardiovascular disease is one of the leading killers. Americans will spend almost $50 more this year to combat obesity than they will to fight cancer. I doubt that we’ve gotten to this point because we wanted to be this large. If weight loss were as easy as making a phone call, wouldn’t everyone be lean? The truth is that it’s not easy. It takes work. Hard work. It takes consistency and dedication. Weight loss is not a short term event. Sure, you could lose weight short term by dieting, but what happens when the short term diet or exercise program ends? I don’t need to tell you. You’ve been there and you know it all comes back, plus a few pounds. There is no magic pill, powder, potion, drink, bodysuit, gadget, website, isolation exercise, gizmo, diet program, TV show, or other shortcut to lose weight. The only bulge that’s going to disappear when you buy this contraption is the lump created by the money in your wallet. Inherently, we all know what we should be eating. We just don’t want to. It’s pretty simple. Eat more real food. Eat more vegetables and fruit and less food from a box. Stop looking for the magic shortcut and eat like you’re going to be eating for the rest of your life. Start simple. If the restaurant you’re visiting has a mascot, think again. If your drink of choice fizzes when you pour it, think again. The biggest excuse for lack of exercise is time. “I’m too busy” is an excuse, plain and simple. The average American spends 264 minutes per day watching TV. Very few people admit to this; everyone says “I don’t watch much TV”. It’s time to fess up. I know someone who complains about being too busy, yet he spends at least an hour each day posting links to music videos on Facebook, usually late into the night, and then tries to figure out why he doesn’t get enough sleep. If President Obama can find time in his schedule to exercise daily, you can find the time too. The extra weight wasn’t put on in just two weeks and it won’t disappear in two weeks. Create a nutrition and exercise plan, dedicate yourself to it, and you’ll see results in time.